Halo, Batman's Dad and... What On Earth is Pinocchio Doing With His Nose? 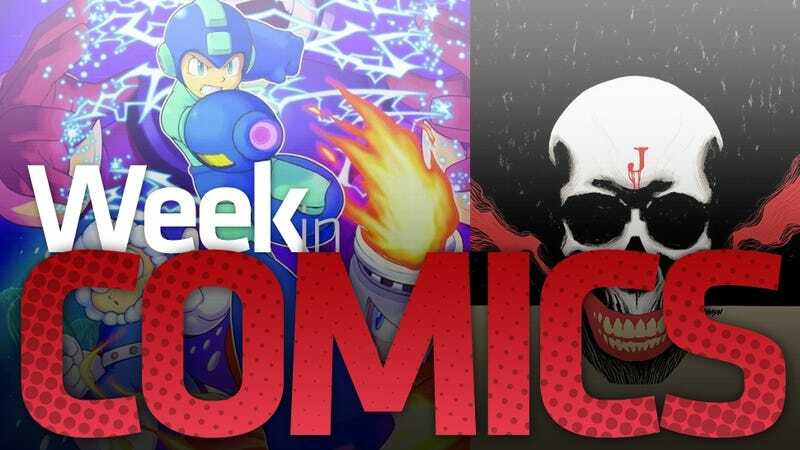 Regular readers of our regular new-comics recommendations round-ups may have noticed that I always list the week's new video game-related comics, but never recommend them. That's because I rarely read video game comics. But, hey, maybe you would like them. As is the case each Wednesday, I do have new comics to recommend to you, and new video game comics to name-check. We do this on Wednesdays because that's when fresh comics hit comics shops and your favorite digital devices. Chew #19 I didn't like the first issue of this series. The concept is neat: It's about an America where chicken is outlawed and a man can learn people's past by chewing on their corpses. I didn't care for the art or script. But readers of this round-up love Chew. They're always writing about it in the comments section. So let the people's voices be heard! They recommend Chew like I recommend Grant Morrison's every last scribble. Official summary of the new issue: "'Flambé,' Part Four Welcome to Area 51, Tony Chu. Would you like some steak sauce with your dead extraterrestrial?" Moon Knight #3 A new issue about Marvel's other lunatic super-hero (besides Deadpool). The first two issues were superb. Official summary of the new one: "You've seen what insanity the new Moon Knight can do, but how is he doing it? Find out here! Plus, who is the kingpin of L.A.? And why do all the other criminals cower at his feet? And just how far is Moon Knight willing to take his new blood fued? (Hint: pretty damn far!) From the Eisner award-winning team that brought you Daredevil, Halo, and Avengers." DC Universe Online Legends #11 Official summary: "Luthor unveils his next move in the elaborate game he's playing against Superman and Brainiac—but how will it change the DC Universe? And Lois Lane is holding back a shocking secret from her husband—when revealed, it'll rock the Man of Steel to his very core!" Halo: Blood Line (collection) Official summary: "The prospecting vessel Long Time Coming is more than your average explorer ship. Underneath the grit and grime, it's part of the Office of Naval Intelligence, and its crew and 'prospecting equipment' are en route to the front lines. That is, until the ship encounters a strange phenomenon in slipspace that sends the vessel plummeting toward an unknown planet. But they're not the only ones shipwrecked on this world - a world that's more than just an anonymous hunk of rock. Critically acclaimed comics scribe Fred Van Lente teams with up-and-coming artist Francis Portela to bring you Halo: Blood Line—a story of war, survival and, above all else, a family of Spartans who will never let each other down." Mega Man Vol. 2 #3 Official summary: "Let the Games Begin!' Part 3. Dr. Wily is trying to take over the world with his stolen Robot Masters, but he didn't count on Mega Man! The young hero is tearing through the would-be world conquering robots, but is the power going to his head?" Penny Arcade Vol. 7: Be Good, Little Puppy (collection) Official summary: "Two and a half million passionate, obsessed daily readers can't be wrong! Penny Arcade is one of the most-read webcomics ever, with multiple books now in print. Chockablock with gaming in-jokes and pop-culture commentary, this comic is the ultimate epic of the gaming life, and essential reading for geeks everywhere. Penny Arcade follows the adventures of Gabe and Tycho, two obsessed gamers with a deliciously wicked sense of humor and an irreverent way of looking at the world." Marvel Super Hero Squad MMO Magazine #1 Official summary: "You've read the comics, you've seen the hit TV series - now, prepare yourself to be part of the experience in Super Hero Squad Online! Join the nonstop adventure with your favorite Squaddies, and get the inside scoop on the upcoming massively multiplayer game in this mammoth magazine! Collecting Super Hero Squad Online Game: Hero Up! #1 and Super Hero Squad Spectacular #1—plus posters, games and more." The ComiXology Comics app and website offer a fresh batch of new and old digital comics this week (though beware that Marvel doesn't offer comics on all of the services' platforms). Highlights this week include more old issues of Walt Simonson's run on Thor and a pile of excellent Vertigo comics that actually launched on ComiXology's shop over the weekend (when they were half-price… I did Tweet about that sale. You follow me, right?) The Vertigo stuff encompasses the first nine issues of Grant Morrison's wonderful meta-fiction super-hero series Animal Man (buy issue #5 if you buy nothing else this week), the full six issues of Demo Vol. 2, the strong first eight-issue Viking period piece from Northlanders, Jason Aaron's stunning both-sides-of-the-story Vietnam War drama The Other Side and a lot more. A few weeks ago, I asked the fine people at Bergen Street Comics in Brooklyn which great graphic novels I might be missing. One of them told me I should check out a book called Pinocchio. which seemed like an absurd answer. I am a grown man, despite the fact that I can sometimes be seen purchasing Green Lantern comics. Then the Bergen shop guy said he could show me a non-shrink-wrapped copy. Huh? The store kept the only open-able copy behind the counter because the book was kinda perverted. That seemed even more absurd, too. Well. I trust people at the comics shops, and it helped that they said the book won the grand prize at Angouleme, the great comics festival in France. Risking $30, I bought the book. Last weekend, I read it. The shrink-wrap was appropriate: early in the book, Geppetto's wife does something with Pinnochio's nose that children shouldn't see. Tell me what you're reading this week and which great comics I'm missing.